As wedding planners, Creative Destination events made my wedding day seamless; even with the last minute change from the beach ceremony to the villa due to the rain. There was never panic or disorganization. Your staff interceded when necessary and execute the changes without me having to worry about a thing. I cannot thank you enough for such a stress free wedding experience. Again, I can’t say how happy I am with the process and your companies. Thank you for everything. 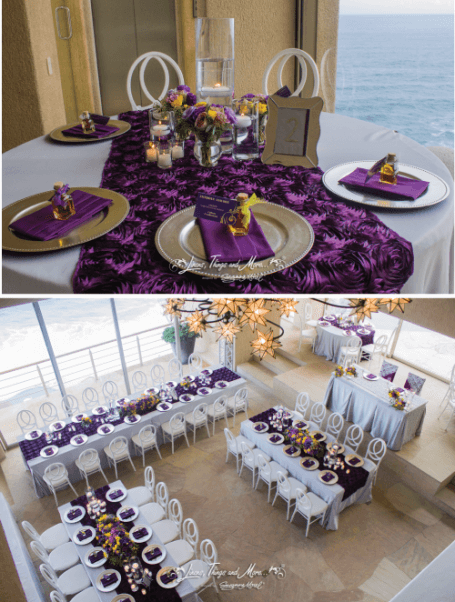 This entry was posted in Cabo event design and decor, Cabo Villas, Cabo Wedding planner and coordinator, Creative Destination Event Company, High end set-ups, Inspiration, Testimonials, Wedding Decor in Los Cabos and tagged best wedding decor in cabo, Cabo Villa Weddings, destination wedding Los Cabos, Eggplant Color Decor, Weddings in Cabo.